Roundtrip in a Zodiac boat to the Goéliche inn at St. Petronilla on the Orleans Island for a gourmet meal at the restaurant Vue. Brunch, breakfast, lunch, supper, 5-7. 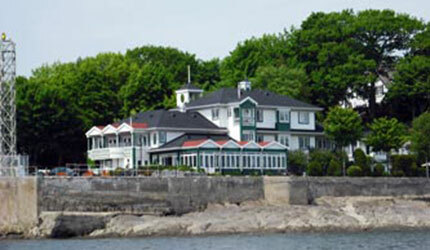 Set at the West of the Orleans Island, 15 minutes from the Old Quebec, this inn has 16 rooms available and is open all year long in an exceptional setting along the St. Lawrence River. This restaurant’s glass roof allows you to enjoy a delicious meal while watching the crossing of the boats.